If you?re like me, not only do you love trolling thrift stores and consignment shops for your everyday wardrobe, but you?re also on the hunt for incredible finds.? 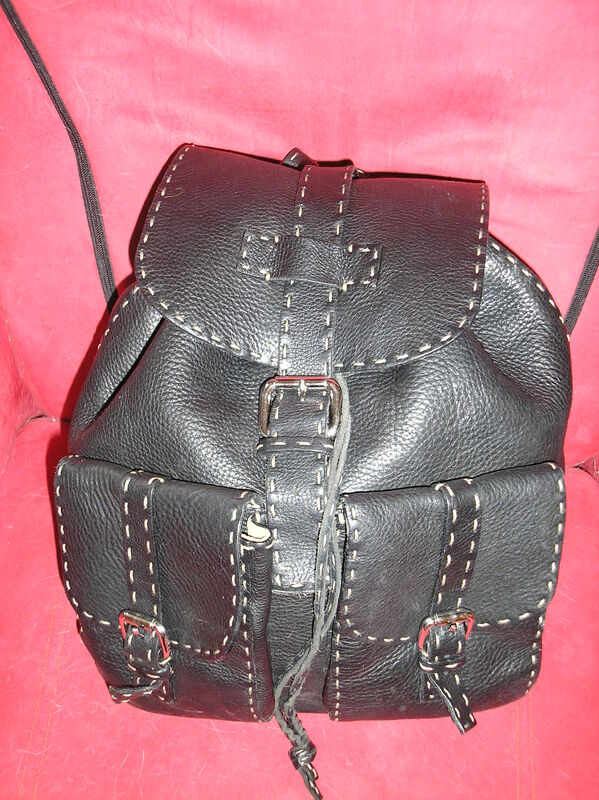 For me, those finds typically come in the form of a drawstring handbag.? I once found a Botega Veneta in a thrift store for $78, which at the time was about 10% of the retail price.? On another occasion, I found a brand new Coach bag at a consignment shop for $60.? A question I am frequently asked is: ?How did you know they were real??? 1)????? ?Made in? label ? This is an easy one!? If it?s made in China, it?s not a real Prada.? 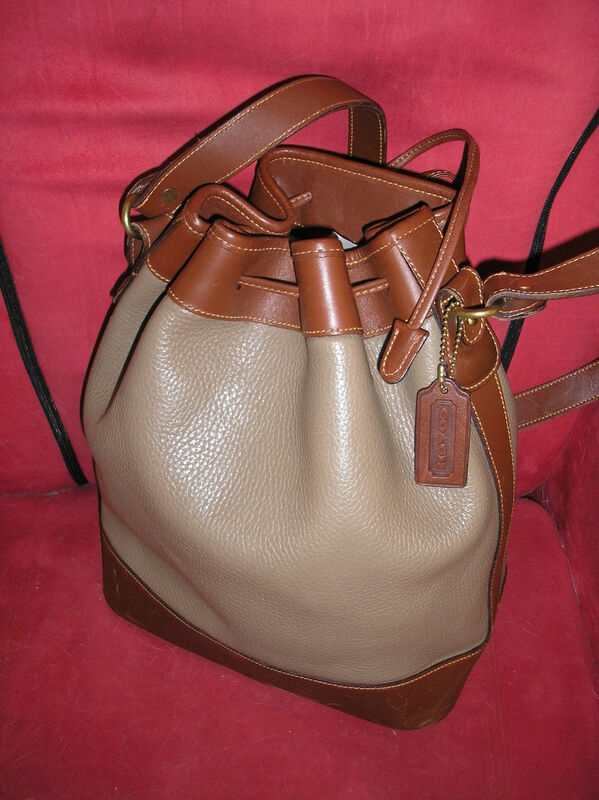 Look up where the handbags you love are made, so that you can pick out that give-away immediately. 2)????? Stitching ? All high-end hand bags have completely perfect stitching.? This is true across the board.? If there is even one centimeter of a flaw in this department, it?s not real.? 3)????? Lining ? The quality of the inner lining in a high-end purse is of a similar quality to the outer material. ?If the outside looks nice, but the inside lining is a cheap nylon or the like ? toss it!? It?s bogus.? Note that most top designer bags have a ?signature? lining, so if you become familiar with your favorite designer?s linings, you have some key information. 4)????? Hardware ? 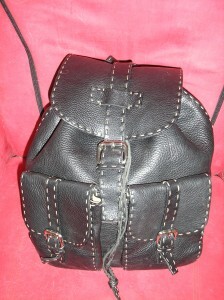 The hardware on an expensive bag will be of the same high quality as the leather (or other goods) and lining.? Many companies also have ?signature? hardware.? For example, every bit of hardware on a Prada bag ? from the smallest grommet to the largest clasp ? will be stamped with their name.? Their zippers are made by a company named Lupe.? Find that stamp on the zipper head, and you?re likely looking at the real McCoy. With these tricks-of-the-trades in mind, be sure to do further research on the designers you love.? Many have signatures like Prada?s hardware stamps.? Know what they are before you head out to find the bag of your dreams. Also, develop an ?eye? for quality.? If you live in an area that has company stores for these high end brands, visit them to study the merchandise and speak with the sales people.? You can also visit department stores like Bloomingdales that carry both the high-end and less expensive lines.? Look at similar bags from both categories right next to each other.? Rather than just focusing on which one you like better, key in on fabrication, hardware, detailing, stitching, etc, as comparison points. Now you have all the info you need, when hunting for an authentic designer bag.? Be sure to send me picture of your next find! New York City. Home of $ticker $hock? So you wanna come to the Big Apple?? You start your research for hotels and?What?? Are they kidding?? Where do they get the nerve to charge that!!? Ok, NYC can be an expensive place.? However it?s also a place with only a?myriad of choices.? So take this little romp with me down the avenue less traveled and you?ll have a ball without breaking the bank. Lodging: Think out of the box and try a NYC style ?B & B? rental instead of a hotel. We don?t have those oh so quaint Victorians here, but you can opt for an apartment rental, hosted or unhosted.? You?ll either get a room in someone?s home or a whole, furnished apartment to yourself.? These offerings run the gamut from the most basic to the most luxurious and are located all over town.? This is especially good if you are traveling with a group.? The prices are lower than most hotels and you?ll have more space plus a kitchen.? One agency that books these is http://www.citylightsbedandbreakfast.com. Prices range from $80 ? $300 per night. Entertainment: There are countless choices of? things to do in the city, totally free, especially outdoors in the summer.? You can catch everything from movies to concerts to Shakespeare in the Park on a warm summer night por nada.? Go to http://www.nycgo.com/free/ for listings. If a Broadway show tickles your fancy, there is an alternative to standing on line at the TKTS booth.? Go to http://playbill.com/ and become a member for free.? This will allow you access to their discounted tickets page.? You can pick them up at the theater, so purchase the same day if you like. Shopping: Who doesn?t want to take advantage of being in the Fashion Capital of the world?? Here?s a tip: It?s also the bargain capital! The Carlisle Collection, the shop at home company, has a little known outlet store tucked away in an unassuming midtown office building.? Go to 423 W55th Street, between 9th and 10th Avenues.? The basement and the 5th floor are where the action is, at up to 80% of regular retail. Do you love that easy, unconstructed feel that Eileen Fisher does to perfection?? Check out the Boutique at 314 E 9th St, between 1st?and 2nd Avenues in the East Village.? Almost every item they carry is discounted up to 60% off regular retail. Got a hankering for Hermes?? 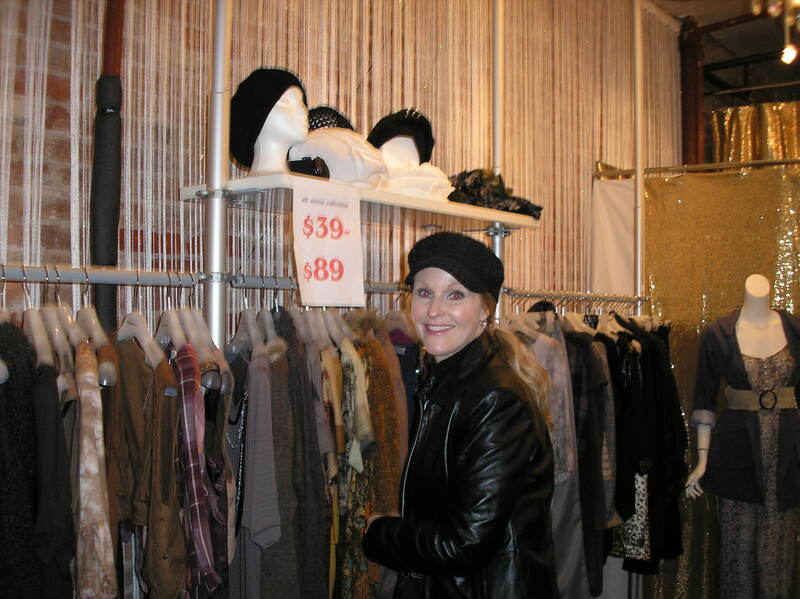 Check out La Boutique designer resale shop at 1045 Madison Avenue, between 79th and 80th Street.? Ring the bell and ascend the wooden staircase to the 2nd floor.? You find all the top names starting at about 1/3 or regular retail.? Such a deal! Hmmm.? So what to do with all the money you?ve saved?? How about a $12 cappuccino, with tax & tip, in the lobby of the Plaza Hotel, at 59th Street and 5th Avenue?? Wait!? Where are you going?? Don?t run away! Eat in Midtown for a Buck? Hell Yeah! Warning!? Only the tightest of tightwads should read this post. Of course we love to shop, but a girl’s gotta eat sometime!? You could sit down in one of the 26 seats at Masa in the Time Warner Center at Columbus Circle.? ?There, you’d? ?spend 3 hours having the most extraordinary dining experience; one you will remember for a lifetime.? At the end, you’ll? plunk down a mere $300-$500. In a city of extremes, we’re going to the other right?here & right now.? We’re talking about eating for?one American dollar?in Midtown Manhattan. That?s right.? One dollar. You can visit no less than 4?pizza joints where a slice ranges from?99 cents to 1 dollar.? ?Bros Pizza can be found at the SE corner of 40th St. & 9th Ave. and the SW corner of 38th?St. & 8th Ave.? ?Slices are $1; you can get 2 & a drink for $2.75.? They also have a location on St Mark’s Place between 2nd & 3rd Aves. in the East Village.? The Z Deli on 8th Ave. between 48th & 49th Sts. is serving up 99 cent slices, as is a no name counter on 9th Ave. at the corner of 41st St. But I’m lactose intolerant, you say!? Then how about some chicken?? Piece of Chicken at 362 W. 45th St. in from the SE corner of 9th Ave offers real southern fried chicken for $1 a piece.? Or you can get 2 pieces and a side dish for $4.? The most expensive item on their menu is a smothered pork chop with rice?and?two greens for $6.50. I’m a meat-n-potatoes girl, you opine!? Will ya settle for a dog-on-a-bun?? Most of the hot dog carts along 8th Ave. from about 46th St.?through the?50s sell them for $1 each during the day. But I want more healthy fare!? Then how about?a salad?? The magic number at Stiles Farmers Markets seems to be $1.? ?Head of romaine lettuce or bunch of?broccoli, an avocado, or pound of tomatoes… all sell for a buck each.? You can spend $5 and make a salad for a whole group.? There are also lots of fruit for a dollar or less a pound.? Of course, prices change here, but I’ve found them consistently the lowest around.? They have 2 locations: 352 W. 52nd St., between 8th & 9th Aves. and 569 9th Ave., between 41st & 42nd Sts. (right next to the 99 cent pizza joint). So…mangia!? And let me know how you liked your cheap eats. That, my friends, is the answer.? If you don’t know what you have, you can’t know what you need.? If you don’t know what you need, you’ll buy things you don’t, which is a grand waste of money.? How many of us have a closet full of many different sizes of clothing?? It’s not an empowering experience to be greeted?with every time we open our closet.?? No woman enjoys being reminded of when she was a size 6, if she is now a 14, or of when she was a 16, if she in now an 8.? I was discussing this “multiple size syndrome” one evening before teaching a class?with Jessie Garza, a well known stylist. ?He termed this as: “our closet mocking us.”? Not exactly a welcome notion. For some reason though, we seem to have trouble letting go of those unnecessary items.??? Cleaning your closet will put an end to this “mocking.”? The goal is to be confronted with a closet full of clothing that?you love, that fit correctly,?and?are stylish?and flattering –? ?every time you open the door. 1st Step – Take every single last item out of your closet and throw it on the bed.?? Yes! 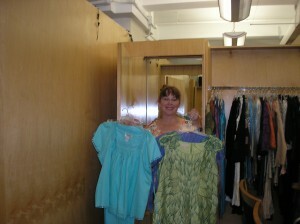 ?Then pick up each garment – one-at-a-time – and?decide which one of?three? ?piles it will go in:? ?????????????????? ?Pile #1 is the throw away pile.? It’s comprised of the things that no one will ever wear again.? Either it has holes, or stains, or cigarette burns.? It’s faded or has bleach spots; let’s face it, it a piece crap! ?Toss it!? And don’t look back! ?????????????????? Pile #2 is the give away pile.? Maybe you?won’t wear it again?for any?number of reasons, but it’s still usable.? Either it’s the wrong size, or it’s no longer age appropriate, or it’s no longer contemporary enough.? If you’re 50 years old and that micro mini still fits…TOSS IT!? You’re too damn old to be running around in a skirt up to your whosiwhatsis (I’m that age too, so I can say that).? Anything decorated with the Bedazzler, toss right out (the window).? Linebacker shoulder pads – fuggetaboutit!? Now there might be things in this pile that have sentimental memories attached. ?That’s fine.? You don’t have to give it away, but put it away in a special place, so that you can visit it when you want; not every time you open your closet.? The things in?Pile #2 you can?donate to charity or if new enough, bring them to a consignment shop for possible resale. ??????????????????????????? Pile # 3 should contain all you want to keep.? You should love these items, they should fit and should?be contemporary or able to be made so by adding a trendy accessory or some?small alterations.? And they should be age appropriate for you.?? Every single piece in this pile must be tried on to determine if it meets all of the criterior above.? This is where the help of a professional, sister, or friend is most important.? Try them on piece by piece?and be ruthless with yourself.? Remeber your goal! Once you have tried every last?thing and decided what you’re keeping, put the items back in the closet with the hanger hook facing outward instead of inward.? That way, if after 6 months it’s still facing that way, you know it’s not something that you like, want to wear, or need.? Get rid of it! After this process maybe the only thing left in your closet is one white blouse. ?That’s OK!? Now you know what you have and what you need. This will definitely cut down on wasting money on unnecessary purchases.? Come back for my?future post about some techniques to help determine the correct styles for your particular body.? 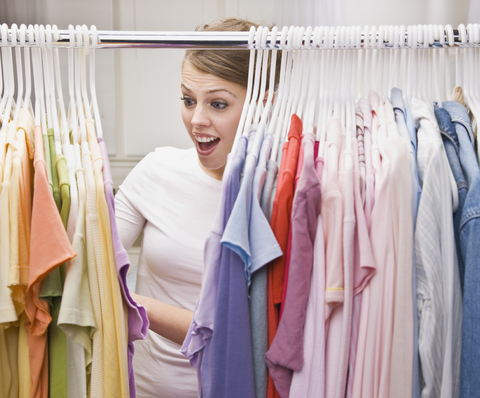 This will aid you further in ‘restocking” your closet. Until then, what item?in your closet makes you say “What was I thinking!? 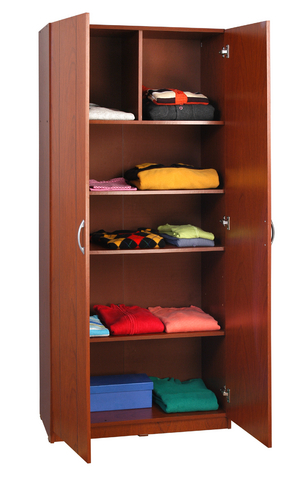 For?closet consultations either in person or remotely, call Pamela at 800-808-4614. Walking down the street on a bright sunny spring day, cherry blossoms wafting through the air like a gentle snow, a girl’s thoughts turn to…BARGAIN HUNTING of course!? Some of the best sales for those truly motivated by the thrill of the hunt are just around the corner.? ?Below are three of my favorites.? Shopping these sales are a win, win, win situation for everyone. You are getting fabulous things you might not usually have access to. 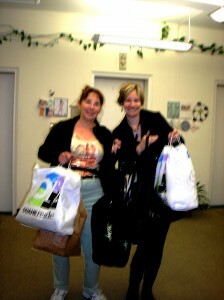 You are reusing & recyling both when you shop & donate and you are helping? incredible organizations continue their work. Plus they are just enormous fun? What more could you ask for?? This has been “The Hottest Sale in Town” since 1963.? I went to my 1st one in 1980(I was only 5 years old).? This sale is chock full of designer duds donated “gently used” from NY’s elite and brand spanking new from all the top designers in town.? You will find names like Manolo Blahnik, Burberry, Coach, Furla Classics Collection, Carolina Herrera, March Boutique, Nicole Miller, Bettye Muller, Tracy Reese, Joan Rivers, Rachel Roy, Theory, XOXO,and more for men, ?women and children.? They have one of the most extensive fur salon’s ever(gently used).? All proceeds benefit the Lighthouse’s efforts to fight vision loss and help make better the lives of those touched by it . Now in days of?old when men were bold,?all you had to do to get first dibs on the best loot was to get there at about 7:30am and wait on line for the doors to open at 10.? Alas fair maidens and courtly gents, this is no longer the case.? There is a preview night, May 12th , with? tickets going for $175, which includes admission to all? public days too.? Tickets for individual public days are $10each or $30 for all 4. Buy online before May 7 and bogo free.? 75% of the ticket price is tax deductible.?? The stock is replenished daily, so it’s worth a few trips. Get there between 8-9am.? The line will be around the block by the time the doors open. Wear clothes that come off and on easily. Speed is the name of the game here. If you snooze, you lose! Wear a bag with a shoulder strap that you can sling across your body so that both hand are free. Have lots of fun.? This sale is a blast! I’ve gotten St John’s knit tops for $5 & Hermes shoes for $6.? You will see every major designer.? Ferragamo, Yves St Laurent, Dorney & Bourke, Ettienne Aigner, Adrienne Vittadini, Ann Taylor, Coach & Prada are some of the names I have bought in the past.? There is so much here to go through . ?I have gone up to 4 different day in past years and still not seen everything. Sat May 1st, 9am to 5pm? This is the largest semi-annual tag sale in Wilton CT.? It has it’s roots in a town rummage sale which began in 1931.? In 1952 there was a donation of both a mink coat & a sink and the name Minks to Sinks was coined and? has stuck.? I have known about this sale for years and have been meaning to get there for as long.? I’m sad to say I haven’t made it yet, however I know it’s one of the best.? I know this because it is a favorite of the “dealers”.? In fact I’ve heard (a rumor only, not verified by me) that dealers get there really, really early actually sell spaces on line.? If that’s true, that’s a good sign.? Will this be the year you’ll run into The Elegant Tightwad rummaging around.? I’m hoping it will be!? It always takes place the first weekend in May & October.? I’ve also heard the clothing?here is incredible.? Here’s?some Directions.? Proceeds from this sale benefit? FCA (Family & Children’s Agency) of Norwalk. The weatherman is being kind to us this week, so it’s a perfect time to save money on the season’s hottest duds. 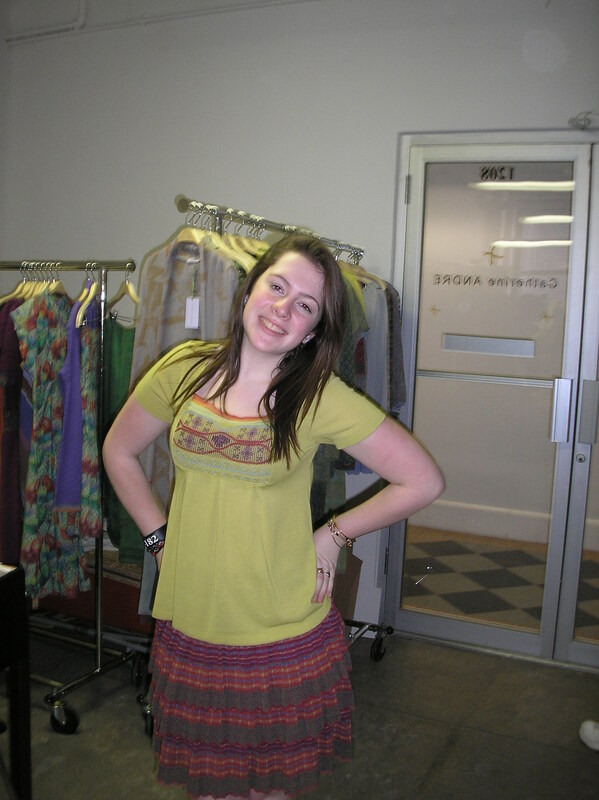 ?Here are some of this week’s sample sales. ?We have big? & not so big names, but all fabulous,? ?discounting up to 80%.? (Just west of 8th Avenue), Credit Cards only, No strollers. Rock & Republic!? 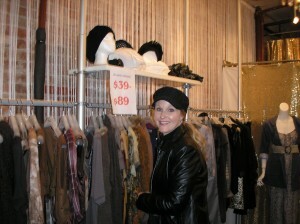 Blowout sale at the Metropolitan Pavilion, 123 W 18th St, bet 6th & 7th, 4th Fl, 4/16-4/18, Fri 4-9, Sat & Sun 9-7.? Men’s, women’s & accessories up to 80% off.? Check back later in the week for more sales! Below is a press release for a new site giving great deals.? Looks pretty good to me.? I think I’m going to try this massage.? I LOVE Ayurveda! ?Tuesday February 16th, 2010.? New York, NY ? Every Tuesday a new NYC spa will offer a service for just $25 at?SpaSally’s www.25Tuesdays.com The deals can only be purchased on Tuesdays, but can be used any day within a year. When the clock strikes midnight the deal is gone. The $25 spa deal can only be purchased online at www.25Tuesdays.com? ?Abhayanga a-bh-yan-ga, an Ayurvedic Body Massage with Herbal Oils, is a very beneficial massage. Oils and strokes are chosen according to body type and condition. This 30 minute massage can benefit your body in many ways like removing stress and fatique and stregthening the immune system. It also includes 10 minutes of dry brushing or silk gloves exfoliation, which is fantastic for your skin.. Happy Valentines Day to you! Thirty minutes not enough? Go for the hour body massage with the 10 minute dry brushing! Treat yourself or someone else you love with this Ayurvedic experience that cares for your body inside and out! The Ultimate Abhayanga massage and dry brushing! Face it, sometimes an hour is not enough.. 90 minutes of massage and 10 minutes exfoliation..This is the one where you really let it all go.